Many years ago, when I was just starting up my music teaching studio, a friend and I would get together every Thursday morning to talk about writing. Sometimes we wrote to prompts when we were together, sometimes we shared what we’d been working on, sometimes we just talked. I was writing in a somewhat desultory way, since my main focus at the time was still music. But even so, I loved writing and I had the vision of seven-year-old me in the back of my mind. My friend and I both read Carolyn See’s Making a Literary Life and then discussed it. And we decided to implement its advice on charming notes. What is a charming note? Exactly what it sounds like. Every week, each of us would choose one writer to whom we’d write a letter telling them how much their work had meant to us. We bought pretty paper on which to write these letters when we couldn’t get our hands on the relevant email addresses, and we began sending them out. There is something very uplifting about writing to someone unknown to you and telling them something both true and kind for no other reward than the joy of doing it. I was reminded of the charming note ritual a few weeks ago when Jonathan Carroll talked about a charming note he once sent, and the response he received. 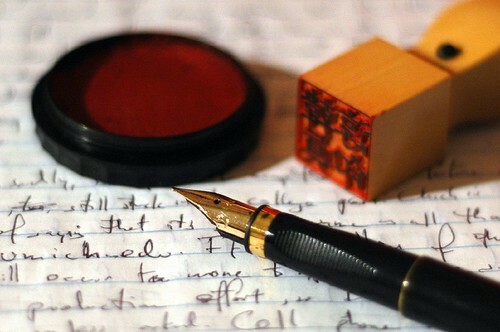 It made me glad all over again that I had written those letters, and I wondered if maybe I could start writing them again, especially now that more writers have email addresses and websites so I can avoid the hassle of buying new stationary and remembering to purchase stamps more regularly. Because charming notes matter. I know how much they matter. Jonathan Carroll said, “It’s a very important thing to tell someone what they do genuinely matters to you. Especially artists, who work so much of the time in solitude and receive little feedback other than reviews.” It means so much to know your efforts have been genuinely appreciated. It means so much to hear how you’ve helped someone or inspired someone or given that person something to love. When I’m working, I’m alone (except for the little dog fast asleep beside me). When I’m writing a novel, it can be months and months before anyone gets to see any of the results of my time, and even then, they are often reading it as a favor to me so they can tell me how to make it better. So much of my work goes on in my own head, a huge contrast from the days when I spent hours of my time engaged in face-to-face teaching. I often can’t see the effect I’m having with my words. So when someone makes the effort to write me a note or leave a thoughtful comment, whether it’s about my blog or a short story, they allow me to see my work from a completely different perspective. They give a new meaning to the words I have shared with the world. And they inspire me to continue to write. Such is the power of the charming note. I wonder who I’ll write to next. Amy, thank you for an awesome blog post! Recently I just began trying to write notes to people, thank you notes and I-miss-you types of notes. I used to have pen pals when I was younger, but life kind of took that away. I’ve also been trying to sit down and figure out how many people I know, appreciate, and how many people have helped me with various things and situations over the years. Also, running a business, I have business cards in stacks and I want to get them organized so I can send more notes. I appreciate the inspiration! Thank you!